Miami Beach covers the area that starts on First Street up to 86th Street and Collins between the intercostals to the west and the Atlantic Ocean. Miami Beach is the oldest part of Miami Florida where most of hotels in Miami are located, with Iconic landmarks such as The Fontainebleau, the Eden Roc and the Delano Miami Hotel. Miami Beach hotels that are located between 25th street and 6th street are usually larger and more recent than the ones located between 25th street and First Street. Most of those hotels in Miami have been (or are in the process of being) substantially rehabilitated or totally rebuilt. A few new Miami Beach hotels are being built, such as the Fontainebleau Tower, the Canyon Ranch and the Shelborne, the lattest offers miami vacation rental apartments. The district of South Beach is technically part of the city of Miami Beach. 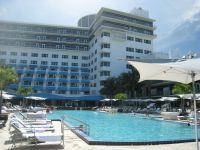 Miami Beach Hotels section gives the best that Miami has to offer for tourist accommodations.